When the indoor antenna receives the signal from your cell phone or data card, the booster amplifies the signal and transmits it through the cable to outdoor antenna and then to the cell tower. And the better the outside signal, the more coverage the indoor antenna can create. “Boost Your Bars” with the Cell Ranger Dual-Band In-Vehicle Wireless Signal Booster. Cell Ranger increases signal bars & call clarity, improves call reception and makes your cell phone signal over 200% stronger. 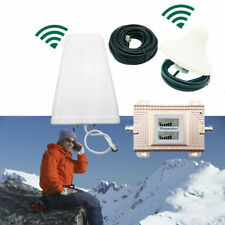 GSM/GPRS/EDGE 850/900/1800/1900MHz. Mounting: 3M tape to Velcro. Frequency Range(MHz)850-960/1710-2170. ( Certain restrictions applied. ). The booster should be warm or hot after it has been working for 30 minutes. If it did get warm or hot, but you do not have improved signal, check the frequency whether it is exactly you are using. Ultra-Low Noise Receiver. AOBOST booster provides a rapid and perfect solution to solve and optimize the weak signal of houses, offices, hotels, elevators, underground parking lots and other small weak signal area. Welcome you all to order. Any problem? Pls do not hesitate to write an email to customer services to solve. We provide the best sale service and after sale service.Thank you. Frequency: 824 - 894 MHz, 1850 - 1990 MHz. referred to as 1900 uses the frequencies 1850-1990. The other band is PCS which is the 800 MHz band. There are two common frequency bands that all cell phone carriers use. How does it work?. Can I use the signal booster when the outdoor signal has 0 bar?. 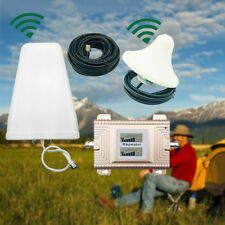 What is the difference of different outdoor antennas?. If the outdoor signal is weak, you need the outdoor directional antenna which should be pointed to the base station to get signal, such as the outdoor yagi antenna, the outdoor LPDA antenna, etc. 0.5W 70dB LCD Dual Band DCS 850/1900MHz Cell Phone Signal Boosters Fit USA AT&T. 850/19 00MHz Dual Band Repeater. Ultra-Low Noise Receiver. The booster should be warm or hot after it has been working for 30 minutes. You should get at least 2-3 bars of stable signal in the location where the outdoor antenna is fixed in, or the booster can't work. Support any phones for any Wireless Carriers in the frequency range . Point the outdoor antenna towards a cell tower. Connect the coax cable from the outdoor antenna to the booster inside. Connect the indoor antenna. ·Coverage: Maximum coverage range 3500 sq.ft / coverage radius about 32.8 ft. The indoor coverage area will depend on the outdoor signal strength. Phonetone Cell Phone Signal Booster & Antenna Home / Office - Dual Band 850/1900. Shipped with USPS Priority Mail. This set of booster was left at my house after the previous owner sold it to me... Been laying around. Looks new :) i dont know much about this comes with all you see. The repeater device features easy installation & operation, build-in indoor antenna and no interference. 1 x Amplifier main device. It could only strengthen cell phone signal, it could not produce cell phone signal,if there is no cell phone signal at all in your area, there is no need to use it. 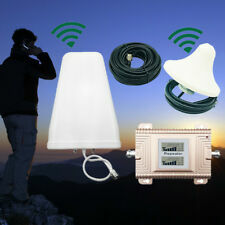 Full kits Dual Band 4G 1900MHz CDMA 850Mhz 2G 4G Mini Signal Repeater Cell Phone Signal Booster Signal Amplifier with Antenna. The repeater device features easy installation & operation, build-in indoor antenna and no interference. External antenna can booster the cellular signal and improve the performance of your cellular device - cell phone or data card/modem. Depending on your location, you may need just an antenna. 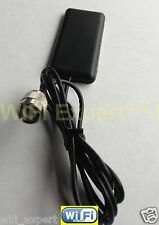 This antenna can be used with or without an amplifier. Color:Car Booster for Verizon ATT 4G. It provides a maximum signal gain of 45dB. FrequencyVerizon AT&T 4G LTE 700MHz. Support for AT&T and Verizon LTE 4G network 700MHz. 1 63dB 700MHz Dual Band Repeater. Compatible NetworkAT&T,Verizon. How does it work?. Can I use the signal booster when the outdoor signal has 0 bar?. Hi, I have a Phonetone cell booster and antenna for sale. 850/1900MHz Dual Band Signal Booster and an Outdoor Omni Antenna. We'll respond you within the next 24 hours. Due to the high amount of international fraud. Dual band cell phone repeater (Up: 824-849 MHz, Down: 869-894 MHz and Up: 1850-1910 MHz, Down: 1930-1990 MHz). Shireen’s Dual band Cellular Repeater/Amplifier increases signal strength and improves cellular communication without a physical connection to the cell phone. It provides a maximum signal gain of 65 decibels. 【BETTER VOICE AND DATA】Reduces dropped and missed calls and provides 3G faster data performance for multiple simultaneous users. 【QUICK, EASY SETUP】 Omni-directional outdoor antenna receives signal from all directions (no aiming required), if you have moderate signal and want to support several network providers, this is a popular choice.